The beautiful tulip flower holds a lot of symbolism. Early Victorians associated tulips with kindness and charity. In North America they are often one of the very first to bloom in spring, welcoming in warmth and new beginnings. And across the globe, tulips are closely tied to notions of deep and perfect love. While fresh cut flowers always make a perfect gift, nothing says “I love and cherish you” quite like a tulip bouquet. Tulips are ideal for birthdays, anniversaries, graduations, and simple acts of spreading love and joy. 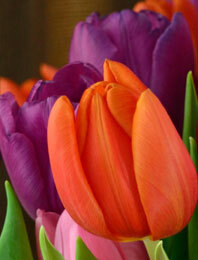 Tulips bloom in a spectrum of bright and punchy colors, and you can find all of them right here in our online store. And while a tulip on its own conveys plenty of meaning, each color represents a little something extra. Red tulips symbolize romance, passion, and true love. Purple tulips symbolize wealth, royalty, and elegance. 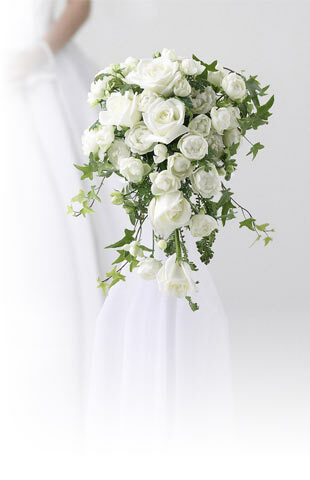 White tulips symbolize purity, honor, and condolences. Orange tulips symbolize understanding, appreciation, and spiritual connection. Yellow tulips symbolize friendship and cheerfulness. Pink tulips symbolize good luck and congratulations. Order a fresh flower delivery of just one color, or combine various colors to create a unique and vibrant tulip bouquet that is all you. Like all of our fresh cut flowers, our dutch tulips are hand-cut to order from one our many acclaimed farm partners in Holland and the USA, guaranteeing freshness and ensuring that the flowers you receive maintain their beauty. The tulip bouquet delivery process is simple: Choose your favorite holland tulips, and we’ll have them cut, packaged, and shipped via cold storage to your door, all within three to four business days. All stages of the delivery process are monitored by our team, so when you need that perfectly timed anniversary or birthday flowers delivery, we’ll be sure it gets there on schedule. Oh, and best yet? Shipping is free via FedEx, and guaranteed with tracking. Because after all, there shouldn’t be anything stressful about a gorgeous bouquet of fresh cut flowers. Here at Flower Explosion, we believe that online fresh flower delivery doesn’t have to be complicated or expensive. We work with only the finest and most trusted farms to ensure that the flowers you receive look as beautiful as they do in the pictures. No flower delivery horror stories here – just spreading joy, one stem at a time. In addition to home deliveries, we offer wholesale tulip arrangements online for event planners and professional florists. We also offer expertly crafted tulip flower arrangements that will please even the pickiest of brides, all at a mere fraction of the price of what you would traditionally spend. If you’re going the DIY route, we’re also happy to send you a flower pack that will enable you to build your very own tulip arrangements. Browse our tulips, choose your favorites, and we’ll get them hand-cut and delivered quickly and with no stress to you.